With no dominant player as a consensus No. 1 and a field which many consider weak on the back end, a Canadian defenceman headed to an NCAA Division 1 program this fall is rated as one of the top prospects in the final rankings of candidates released by the International Scouting Service (ISS). Calgary, Alta. native Cale Makar was the top player in the Canadian Junior Hockey League (CJHL) in 2016-17 and is ranked ninth overall among all skaters by ISS and no doubt will hear his name called at the 2017 NHL Entry Draft. Sweden's Timothy Liljegren at No. 8 is the only rearguard ranked higher. Makar, who is committed to the University of Massachusetts Minutemen for next season, had a career year with the Brooks Bandits of the Alberta Junior Hockey League (AJHL) in 2016-17. He had 24 goals and 75 points during the regular season, was named CJHL player-of-the-year and put the icing on the cake by being named MVP and top defenceman at the national championships (RBC Cup) for the second consecutive season. The ISS scouting report on Makar states: A high octane dynamic skater with high IQ and a willingness to jump into the play at any time. Tremendous shot that seems to surprise goalies and get on them very quickly. Has developed some bad habits playing against weaker competition and he tries to do too much at times. Needs to bulk up and add strength. Will be a very good college player with pro potential. Another NCAA-bound player could also hear his name called among the first 10 called in Chicago. Centre iceman Casey Mittelstadt, who played in both the United States Hockey League (USHL) for the Green Bay Gamblers and then returned to play high school hockey at Eden Prairie High School in Minneapolis last season, is ranked seventh overall among skaters by ISS. Mittelstadt, who has committed to the University of Minnesota Golden Gophers for 2017-18, was the only high school player on the U.S. Under-18 national team which captured bronze at the world championships in April. He finished with four goals and seven helpers in seven games at that event. When it comes to current NCAA performers, forward Ryan Poehling of the St. Cloud State Huskies is the top ranked skater at No. 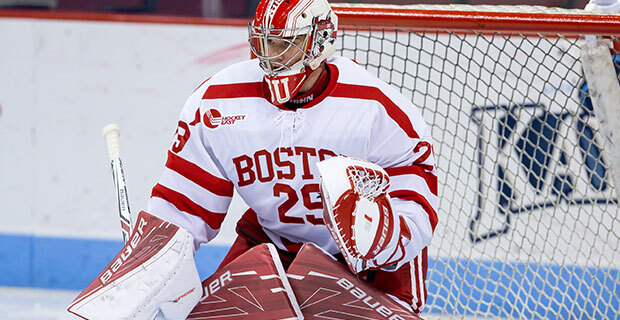 15 while goaltender Jake Oettinger of the Boston University Terriers is the top rated North American puck-stopper, second only to Finland's Ukko-Pekka Luukkonen. An outstanding two-way player and excellent playmaker, Poehling had 13 points (7G, 6A) in 35 games as a Huskies freshman last season. Oettinger, at six-foot-four and 205 pounds, has the size most NHL teams look for in a goaltender. He came through the U.S. National Team program, playing for the Under-18 squad in 2015-16 and the Under-17 team in 2014-15. As a freshman at BU last season, Oettinger appeared in 35 games with a record of 21-11-3, .927 save percentage and 2.11 goals-against-average as the No. 1 player between the pipes for the Terriers. Poehling and Oettinger, along with Michigan Wolverines defenceman Luke Martin (ranked 51st overall by ISS), were the only three current student-athletes invited to the recent NHL Scouting Combine in Buffalo. Two other Canadians, who are headed to Boston University this fall, were also recognized in the ISS rankings. Halifax, N.S. native Shane Bowers was ranked 27th among all skaters while Cameron Crotty from Greely, Ont. came in at 91. Bowers, who has played for the Waterloo Black Hawks of the USHL over the past two seasons, was a member of the Canadian Under-18 squad in 2016-17 and also took part in the USHL Prospects game. He had 51 points (22G, 29A) in 60 games with the Black Hawks this past season and has tallied 84 points in 116 games over the past two campaigns. Crotty is heading to Boston after two seasons with the Brockville Braves of the Canadian Central Hockey League (CCHL). Considered an offensive defenceman with good playmaking skills, Crotty played in 98 games for the Braves and compiled 31 points. Two other Canadians who are NCAA bound in 2017-18, King City, Ont. native Mario Ferraro of the USHL's Des Moines Buccaneers (Massachusetts Minutemen) and Red Deer, Alta. native Kale Howarth of the British Columbia Hockey League's Trail Smoke Eaters (Connecticut Huskies), attended the recent combine, but are considered dark horses heading into the draft.